The Stoat, an ermine, is a small mammal belonging to the weasel family. The Hondo Stoat (Mustela Erminea Nippon), particularly found in Honshu, is an Asian species of the ermine family abundantly inhabiting Northern Eurasia and North America. 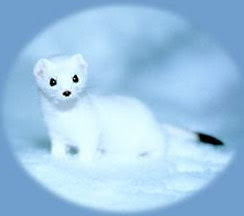 The Stoat is also called Yama-Itachi or Kuda-Gitsune in Japan. Another subspecies, Ezo-Stoat (Mustela erminea orientalis), inhabits Hokkaido, the northern island of Japan, and is classified as a "Near Threatened(NT)" animal in the Red Data Book. The Stoat feeds mainly on mice, rats, birds' eggs, and insects. In spite of its lovable appearance, the Stoat has a rather aggressive nature and sometimes attacks hares, which are many times larger than itself. The Stoat is characterized by its change of pelage color. Its brown mask and back, maintained from early spring to summer, is replaced by a snow-white coat during the winter season. However, the tip of its tail remains black throughout the year. The only difference between the Hondo Stoat and the Ezo Stoat is that the former is smaller than the latter. Hondo Stoat males average 18 to 24 centimeters (7.2 to 9.6 in.) and females 14 to 23 centimeters (5.6 to 9.2 in.) long, while the Ezo Stoat grows to 30 centimeters (12 in.) or more in length. The habitat of the Hondo Stoat ranges from alpine zones in the central Honshu region, northward to Aomori Prefecture. Although the Hondo Stoat seldom shows itself to people, a rare glimpse of the animal standing on its hind legs looking around may be seen in forests or highlands in mountainous regions. The Hondo Stoat is designated as a natural treasure in Nagano Prefecture. In the area of Shiga Heights, it is especially well cared for and affectionately nicknamed "Mountain Fairy" as a symbol of good fortune, because of its cute appearance.